For hard copy samples and a catalog, please send us an email with your mailing address and we will drop them in the mail to you. Also, you may view our catalog here. 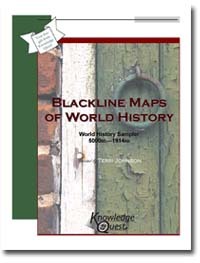 Includes two maps from each of our four time period packets - First Cities and Ancient Civilizations and the Middle and New Kingdoms of Egypt from our Ancient packet - The Norman Conquests and Medieval China from our Middle Ages packet - Native American Tribal Groups and the Expansion of Sweden from our New World packet - and Italy United and the British Empire from our Modern set. This sampler is completely FREE and there is no obligation for further purchase. Enjoy. See also Sample Timeline Pages using the History Through the Ages timeline figures and Timeline Category Stickers.